Twenty-sixth of July Street—which commemorates the date in 1952 when the ousted King Fuad II departed from Egypt, and the Free Officers Movement (i.e., the military) took the reigns of power—is the primary thoroughfare in the island of Gezira, once colonized by the British and now gentrified by everyone else. As the parade marched toward Tahrir Square, taking up three lanes of traffic, everyone became a participant or spectator. We passed the military officers’ club and military-owned grocery, then the gas stations. Every single shopkeeper stood on the sidewalk outside his place of work: some laughing, some unfazed, and some joining the marches. A group of chefs from a chic Asian restaurant filmed the proceedings on their smartphones. “Bread, Freedom, and Social Justice.” Some of these protesters must have chanted that verse thousands of times before. Indeed, the slogan has been immortalized as graffiti on the bridge under which they strode. I know that this isn’t my revolution and that I didn’t endure 18 days in Tahrir against Mubarak’s violent inertia in 2011, that I am just a young Detroiter with a one-way ticket to Cairo. But I find myself deeply invested in an Egypt that guarantees bread, freedom, and social justice for all. With my notebook in hand, I had to restrain myself—or else I would have been chanting along with the crowd. A woman lounging five floors up on the balcony of an art deco apartment building overlooking the Nile yelled, “The People Want …” and everyone in the street below completed the phrase—and on and on it went. Across the Nile stood the towering Ministry of Foreign Affairs, a slick skyscraper with Oriental flourishes. Next to it, Maspero, the government press center, where 28 Coptic Christians were killed and hundreds more were injured a year ago by government vehicles. Justice has yet to be delivered to those who committed the heinous act. But this march wasn’t protesting these vestiges of the old regime; rather, it protested the concentration of power sought by the new would-be pharaoh—President Muhammed Morsi. (Last week, nearly every independent Egyptian newspaper published caricatures of Morsi wearing the gilded facemasks of Tutankhamen or Ramses). That was then. Now, Cairo’s city center and public squares across the country of some 90 million are erupting in protest against the democratically elected president. That’s because on Thanksgiving day, Morsi granted himself extensive, unchecked new powers. This act has set him squarely against the revolution. By way of follow-up, Morsi employed his executive clout to ram through a draft constitution. 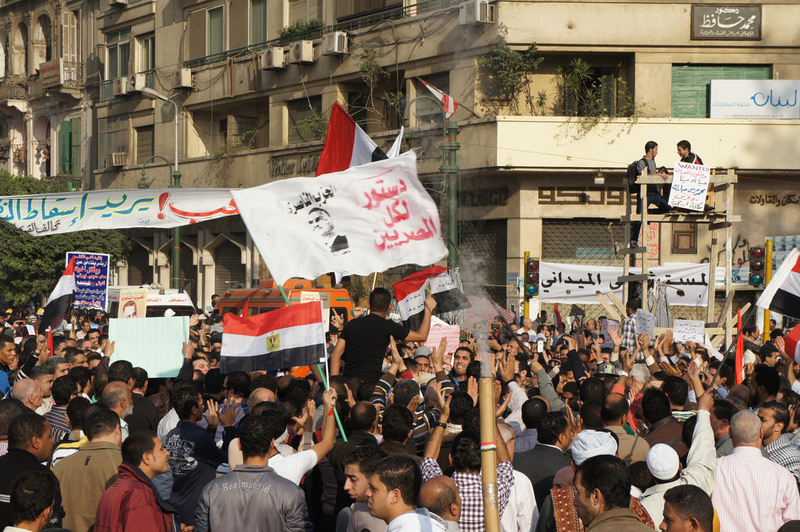 All of which calls into question Egypt’s transition from autocracy to democracy. For months, the country has been in limbo—without a parliament, without a constitution. The constituent assembly tasked with writing the nation’s new set of laws had been on tenterhooks, stalling and deliberating, until Morsi hurriedly advanced a draft constitution (a typo in the first line betrays the haste). To seal the deal, he has called for a national referendum in two weeks. It’s not the worst social contract ever produced, even though it contains provisions that institutionalize military trials and inadequately protect freedom of religion and expression. That the headline on Human Rights Watch’s press release critiquing the draft language’s read “Mixed on Support of Rights” suggests there may still be reason for cautious hope, that Morsi and his party can still be coaxed to do the right thing. The crowd had overtaken the corniche along the Nile and its usually steady traffic flow. The whine of a siren—an orange ambulance—was scarcely heard over the people’s intonations. This is one of Egypt’s remaining injustices—the fact that emergency vehicles have to fight through traffic just like the rest of us. It made me think of last week’s train crash in Assuit province, which killed at least 50 children. Who was in this ambulance, going against the grain of human traffic? The protest chants echoed on the hushed banks of the Nile as the nearly full moon dipped behind a cloud. The crowd by then had doubled, perhaps tripled, as it approached the bridge that crosses the river into downtown Cairo, into the sacred space of Tahrir. The clapping, banging, and honking intensified as converging parades united. It’s a friendly affair on the bridge—some of these camera-wielding folks must be tourists, if not from Europe than from just down the street, holding their children’s hands and patiently explaining to them what the revolution is, why it continues. Too many citizen journalists were videotaping everything. All of the bridge’s eastbound lanes filled with walkers and their flags, while westbound lanes featured men and women gripping flipcams and smartphones, with the occasional car or motorcycle barreling through. Despite all the yelling, noise, and excitement, only one car alarm went off, across the street, and it almost instantly ceased. Standing in front of the distinguished gates of the League of Arab States, a whiff of tear gas comingled with the smoke of sweet potatoes and grilled maize from pushcarts on Tahrir Square’s periphery. Spontaneously, a joyous mob entering the Square applauded. It was peaceful and calm, a stark contrast to the front-page photos of street battles. Sure, those were occurring on side streets, but they represent a sliver of the protest movement. Hell, there was a cotton candy man selling his treats as he wandered through the crowd. Three months ago, the more violent demonstrations that rocked the U.S. embassy here in Cairo were a defining moment for President Morsi. Critics in the West called him out for being too slow in condemning the protests and the breach of the U.S. embassy. Morsi moved to clear the Square, lining its margins with military conscripts and imposing black trucks. Newly budded grass patches were planted in Tahir Square’s inner circle, alongside tree saplings. The martyrs’ families, some of whom has been camped out for over 18 months, were displaced by the greenery, which was organic but felt like Astroturf. Now, that grass was under the shoes of thousands upon thousands of protesters. How many of the people in the packed Square had voted for Morsi in the June presidential run-off? How many had viewed the Muslim Brotherhood’s candidate as preferable to a face of the old regime? How many had lodged a protest vote in order to counter the counter-revolution? From Shubra, one of Cairo’s largest and most populous districts, about 20,000 more marched through the downtown shopping districts from the other direction, also toward the Square. Revolutionary socialists, lawyer syndicates, young and old, just about every face you could imagine, waving flags enthusiastically. Talaat Harb Street—home of the storied cafes in which author Naguib Mafouz used to drink coffee between the beautiful French windows of hundred-year-old edifices—was packed to the gills with people and chants. (“Get out, Get out!”). I walked two blocks west in hope of 3G service to post a tweet, and the streets were virtually silent. It was there that I saw an elderly man with thick silver whiskers and in a traditional brown thobe sauntering toward the Square, encircled by an entourage. It was Ahmed Fouad Negm, the 83-year old poet whose verses had sparred with President Hosni Mubarak and mocked Anwar Sadat. … Where are we today? How many will we be tomorrow? And where will we be at? Whether or not Tahrir Square is overflowing tomorrow, or the next day, the people can be sure that Morsi had heard their message loud and clear. Jonathan Guyer is associate editor of the Cairo Review of Global Affairs and a Fulbright fellow researching political cartoons in Egypt. He previously served as a program associate for the New America Foundation’s Middle East Task Force in Washington, D.C., and as assistant editor of Foreign Policy’s Middle East Channel. He has contributed to the National, Guardian, and Daily Beast. On Twitter: @mideastXmidwest. *Photo courtesy of Kodak Agfa.